Three Canadian players were in action as the second round came to a close on Wednesday at the Tevlin Challenger. Bianca Andreescu (Mississauga, ON) was the first Canadian to reach the second round in Toronto, as she was victorious in her opening round match against Mari Osaka of Japan. Andreescu was dominant in every aspect of her win, needing just a little over an hour to overcome her opponent by a score of 6-1, 6-1. With her straight sets victory, she books a spot in the second round. Last week, Andreescu reached the semi-finals of the Saguenay National Bank Challenger, but had to retire in her match due to an injury. Next up, she will face her compatriot Katherine Sebov (Toronto, ON) who was victorious in her first round match against German qualifier Natalia Siedliska by a score of 6-3, 6-2. Fresh off winning her first career title at the professional level in Saguenay, Sebov continued her successful streak in Toronto, securing a match-up against her fellow Canadian Andreescu. 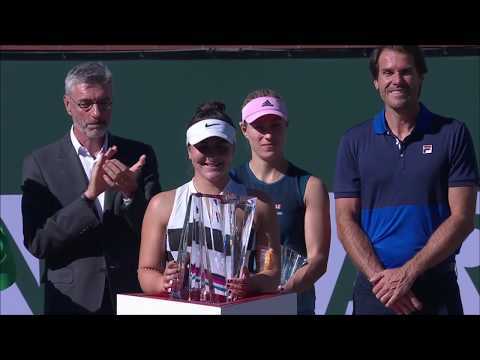 The two have met one time in their professional careers, when Sebov ousted Andreescu in the second round at the Granby Challenger in 2017. She then went on to reach her first final, falling just short of the title. The other Canadian in singles action on Wednesday was wild card recipient Catherine Leduc (Montreal, QC). She had the tough task of facing the tournament’s second seed Conny Perrin of Switzerland. Despite her best efforts, Leduc was unable to come away with the victory, dropping her opening round match 6-0, 6-1. In doubles, Sharon Fichman (Toronto, ON) and partner Maria Sanchez of the United States won their first round match, defeating the second seeds Usue Maitane Arconada and Jacqueline Cako of the United States 6-3, ret. The Canadian-American duo were doubles finalists last week in Saguenay. Two of the tournaments other top seeds were victorious on Wednesday, as Jessika Ponchet of France (no. 6) and Kateryna Kozlova of Ukraine (no. 1) won their matches. Elitsa Kostova of Bulgaria and Naomi Broady of Great Britain, on the other hand, fell in the second round. Click here to consult the Order of Play for November 1.